We are one of the leading exporters, manufacturers and suppliers of Volumetric Karl Fischer Titrator. The offered volumetric karl fischer titrator is uniquely designed for the chemical analysis of fluids, to determine the unknown concentrations of the compounds. Our supplied volumetric karl fischer titrator employs a titrant for the volumetric analysis of solutions. 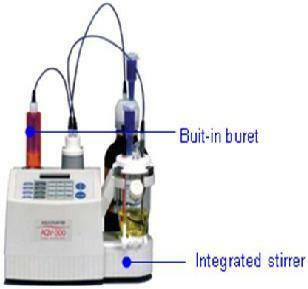 The exported volumetric karl fischer titrator is available at very affordable market selling price. Rated best among the top organisations of the industry involved in manufacturing, authorised dealer and exporting a wide assortment of analytical lab instruments such as HPCL, GC, Spectrophotometer, AAS, Titrator, analytical balance, other lab instruments. we. Scientific Technology Solutions, an ISO 9001:2008 certified Company, started our operations in the year of 2005. In our product range we are offering analytical lab instruments such as Hitachi Japan HPCL system, SCION-BRUKER GC system, Spectrophotometer, AAS, Hitachi Auto Titrator, KF Titrator, Precisa Switzerland analytical balance, Precisa Moisture Balance, & other general lab instruments. Offered products are designed & manufactured from optimum grade raw material with utmost precision at well-equipped manufacturing unit. Our provided products are highly appreciated and demanded by the customers for their reliable performance, unmatched quality and longer working life. We are offering these products in various configurations to choose from. We also provide after sales service of our quality product. The highly advanced and state-of-the-art infrastructural unit at Scientific Technology Solutions has been equipped with all the desired machines and tools, which facilitates the attainment of a number of the firm’s well defined goals and objectives. For reasons of attaining a reputed position across the market, the facility is regularly upgraded. To manage the firm’s operations in the productive and dispute free manner, the facility has been parted into several highly functional units. Further, our vast client base spread all over India & part of the world, is owed to our ethical business practices. We are exporting our products to Africa, Gulf and Asian Countries.